Pioneered by policymakers to support national priorities, behavioral economics, and more particularly nudging, are attracting significant interests from business leaders, willing to bring decision-making to the next level. The deployment of AI-technologies enables companies to leverage new data-powered insights and invest new fields of social sciences to improve decision-making across the organisation. New debiasing techniques such as “nudging” are now be implemented at lower costs to positively influence people’s and group’s behavior — and have a powerful effect on business — without restricting what individuals are able to do. The concept of nudging is based on research in behavioral economics that shows it is possible to steer people towards better decisions by presenting choices in different ways. “Nudges” are subtle interventions that guide choices without restricting them. Before being introduced into the corporate world, nudging has first been pioneered by institutions and governments, notably in the UK and in the US. A prominent proponent of the nuding is former US president Barack Obama who exhorted government departments to adopt behavioural economics to support national priorities, such as enabling Americans to find better jobs or lead healthier lives. Leveraging social sciences in business is not new. Firms, especially in technology, retail and advertising, used behavioural science to shape brand perception and customer behaviour and, ultimately, to sell more stuff. However, business have for long struggled with what economist call decision biases that influence the decision making process. Biases are predispositions of a psychological, sociological, or even physiological nature that can influence our decision making. They often operate subconsciously and by definition are outside the logical process on which decisions are purportedly based. Decision biases can be extremely costly for organizations and many business leaders admit that they are not always rational, and sometimes that rationality—or lack of rationality, rather—has a real impact on the decisions that they make. However, even if the presence of biases flawing decision-making have been known for long, the lack of data to quantify and address the phenomenon have hiderend debiasing actions in the corporate world. This means that most of the potential bottom-line impact from debiasing remains unaddressed. Yet companies can nowadays shape practical, targeted debiasing interventions and achieve tangible business benefits. In that sense, nudges can become are a central element of behavioral economics for organisations, simplifying decisions and making it easier to stick to new habits. A nudge is an easy, low-cost, timely reminder or prompt intended to help people make a good decision without taking away any of their choices. Nudging techniques come in many forms. A good summary is presented in Sunstein’s article Nudging: A Very Short Guide. These techniques include setting default rules, framing, social proof, simplifying procedures, increasing the ease and convenience of desired behaviors, use of alerts, disclosures and reminders, eliciting implementation intentions or soliciting pre-commitments. Example 1: As part of a shift in how it conducted business, a global energy company used text and instant message nudges to change the leadership practices and daily habits of the organization’s senior executives. Executives were given individualized leader action plans to help them adopt three habits related to the change, then used group texts and instant messages to share their progress toward those goals once a week. The prompts helped executives take action frequently enough for the new behaviors to become established habits. Example 2: A public agency used an email nudge campaign to promote an online resource center that had taken time and money to create but many employees ignored. The nudges informed employees about the resource center and encouraged them to seek it out. Post-nudge use of the resource center picked up substantially, so much it shaved hundreds of hours from the time people spent looking up the information elsewhere, which increased overall productivity. 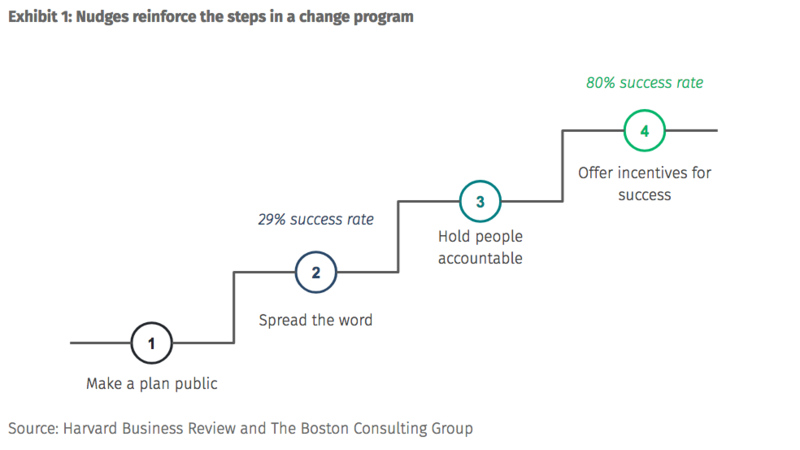 Nudges are also powerful items to increase the odds of success of change programs. The Boston Consulting Group estimates that when nudges are leveraged, they contribute to boost change initiatives and contribute to push the success rate up to 80%. A tremendous jump when considering that more than 50% of change initiatives fail to deliver the expected outcomes (see exhibit 1). Indeed, nudges have a multiplicator effect on 4 transformation steps: when making a plan public, spreading the word about it through workplace communication channels, holding people accountable by asking them to check in with someone else when they’ve reached designated milestones, and offering meaningful incentives for achieving the goal. Advanced analytics and ML-applications trigger a new era for behavioral economics in organisations so that nudging is inheriting the “digital” prefix. Tech-based nudges can feed off socially acceptable group behaviors and spread quickly throughout an organization to induce people to think or act differently. Digital nudges also produce data that organizations can analyze to gauge the success of their efforts, allowing them to learn and recalibrate as they go. 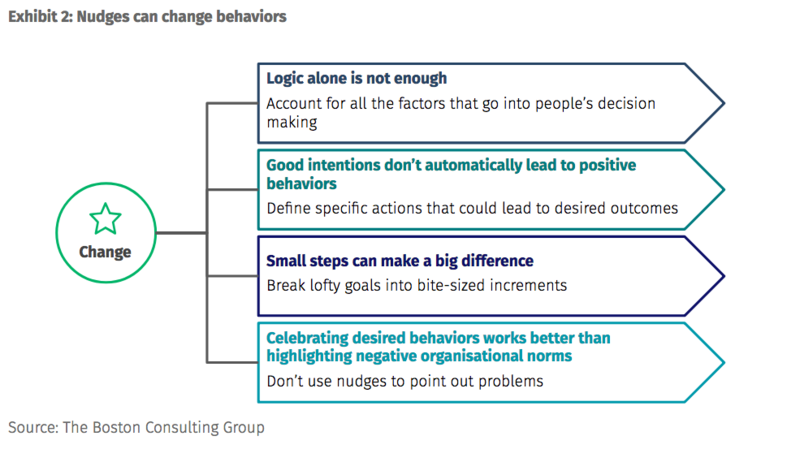 Leaders implementing nudging get the best results when they pick specific behaviors they want to change, determine which have high priority, test nudge campaigns in small segments of the organization, and then scale up what works. When starting with nuding, organisations have to consider 4 key guidelines presented in exhibit 2. In a nutshell, what leaders need to remember is that: Take into account the reality that to change, people need more than logic or good intentions, they need some type of emotional connection to a goal. Make goals as specific as possible. Break the journey toward a new behavior into small steps that are easy to achieve. Recognize and celebrate small early successes, because positive momentum feeds on itself.